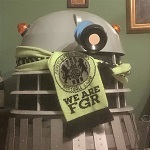 See, I knew FGR would be promoted! Ladies football was spoiled for me by Benny Hill, I'm afraid. Never know, it might make a pleasant change to watch though. Just imagine if we all commit to watching just three games each next season what a difference that would make to the team. It would be great if we could arrange a big day out to one of their games and see if we can muster a big crowd for them. I remember a few years back, when they played Liverpool Ladies away, at Skelmersdale, in the FA cup; there were more away fans than home fans. Yes, we had the usual coach up there. Although we lost something like 6-0, my memory of the day was how professional the opposition was, not only the players but the whole operation etc etc, filmed to be scrutinised later. Good luck in the new season. Has the ladies fixture list been published yet ? I've heard from Slimbridge sources that the ladies are playing there again this season despite our first team not playing a pre season friendly, can this be confirmed please. pity about the loss to a last minute goal. i may have missed it being reported on the main site over the summer -but from the post match interview with the manager-there seems to have been some 'changes/upheavel over the summer-with talk of the team comprising of some of last seasons first team (whats happened to the rest of them ) U18 ladies and development squad . is it the same ladies team manager as last season ? What is the position /has there been a bit of a shake out/changes or is that being a bit over dramatic ? Michael posted this some time ago and I must say, as I've followed the various match reports I've been wondering what happened over the summer. Anybody throw any light on it?